On 3rd December 2016, Bhutan joined the global community to observe the International Day of Persons with Disabilities on the theme “Achieving 17 Goals for the Future We Want”. This theme recognizes the role of these recently adopted 17 Sustainable Development Goals in building a more inclusive society for persons with disabilities around the world. Unlike the past years when all the relevant agencies used to come together to celebrate the day, this year’s celebration stretched out to reach larger audience in different places as different agencies came up with their own programs and activities to observe the event. For instance, the Disabled Persons’ Association of Bhutan (DPAB) and the Special Education Division of the Ministry of Education went to celebrate the day at Tendruk Central School in Sibsoo under Samtse Dzongkhag while the other Disabled Persons’ Organizations like the Ability Bhutan Society and Draktsho Vocational Training Center had a grand celebration in Tashi Taj Hotel in Thimphu. Likewise, the relevant institutes such as the Wangsel Institute for the Deaf in Paro, Muenselling Institute of Khaling and other inclusive schools around the country celebrated the day in their own locality with various exciting activities. Those of us who could not join any of the groups to observe the day had our own plans. A few visually impaired friends in Thimphu had decided to observe the day by offering 108 butter-lamps in a local temple and praying for the wellbeing of persons with disabilities and all other sentient beings in the world. I thought it was a wonderful initiative and I joined them. However, we could not get an ideal temple to go to offer prayers at the end. So we had to do it in one of our friends’ house. He has a big altar room. So we could have enough space for offering butter-lamps and prayers. 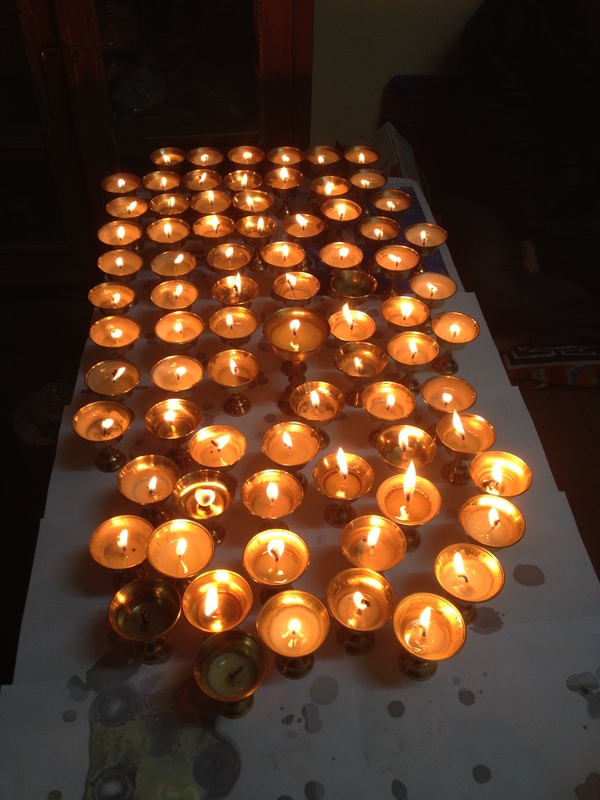 We moved to our friend’s house in the afternoon and after a brief tea session, we lit 108 butter-lamps in his altar room. Then we offered prayers for about an hour. We offered Marmey Moenlam 108 times in memory of the day. At the end of the prayers, we got a sense of satisfaction that we could also join the world in our own ways to celebrate such as an important event. Finally in the evening, we had a simple vegetarian dinner together and called it a day. It was a rare opportunity for all of us to get together and it was such a great fun catching up with many friends after a long time. The United Nations International Day of Persons with Disabilities was first observed in 1992 and since then, the event is celebrated every year on 3rd December to recognize the potentials of persons with disabilities and to celebrate their achievements. In Bhutan, most of these events provide ideal platforms for us to advocate the public on the needs and rights of persons with disabilities so that they can meaningfully participate in the socio-economic and public life. Since the disability movement in the country is just picking up, I think there is still a lot of advocacy and awareness to be carried out to bridge the gap of understanding among the general public about the real capabilities, needs and rights of persons with disabilities in the country. Nevertheless, with such advocacy events happening every year, I hope we would be soon understood better and easily included in the community life.